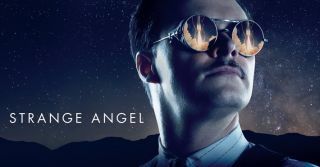 Poster for "Strange Angel" on CBS All Access, featuring actor Jack Reynor in the role of U.S. rocketry founder Jack Parsons. The CBS premiere of "Strange Angel" will take viewers back to a time when building rockets was as wild an idea as creating a time machine. The madcap imagination of U.S. rocketry founder and occultist Jack Parsons features in the new television show, which streams starting today (June 14) on CBS All Access, the online service that also hosts "Star Trek: Discovery". The series' 10 episodes will be released once a week on Thursdays. Bella Heathcote as Susan Parsons; Jack Reynor as Jack Parsons; Rupert Friend as Ernest Donovan. A bright-colored fantasy sequence introduces the audience to Parsons (played by Jack Reynor), one of the real-life creators of Jet Propulsion Laboratory, who lives in a mundane version of 1930s California, the audience soon learns. The story offers a humanizing take on the full impact of his ambitions: the risks he takes clearly lead to big strides in rocket science, but in the process, Parsons also hurts those close to him, casually manipulating his wife, Lucy Parsons (played by Bella Heathcote), and his colleague Richard Onsted (played by Peter Mark Kendall). "Through the course of the show, [these characters] will make extreme and sometimes-questionable choices and decisions, and it was important that we pick actors and people who had an innate charisma and relatability so that we could be ourselves in their story," Heyman said. "As the story evolves, things get darker and more twisted and complicated in terms of the relationships and what these people do and try to do to themselves." That includes Parsons' introduction to occult magic rituals in the premiere. The exploration of rocket science featured on the show is more relevant than ever, the show's producers said. "I think it's pretty amazing that one of [SpaceX CEO] Elon Musk's rockets can land on a platform in the middle of the ocean, and it all started with a tin can pointed upside down, " Dave DiGilio, showrunner and executive producer for the series, told Space.com. One of the early rocket motor experiments at the Arroyo Seco that led to the establishment of NASA's Jet Propulsion Laboratory in California. The science behind Parsons' and Onsted's work also plays a big role in the show's drama. The producers said that they didn't want to gloss over those elements, so they leaned on a team of astronomy and engineering consultants to ensure that the diagrams, rocket concepts and formulas get to shine in the story, too. The television show "Strange Angel" is based off the book "Strange Angel: The Otherworldly Life of Rocket Scientist John Whiteside Parsons" (Mariner Books, 2006) by George Pendle, which is available for purchase on Amazon.